“I should have sent them a thank-you note,” said Megan Ferland, CEO of the Girl Scouts of Western Washington, as Boy Scouts of America — newly renamed Scouts BSA — announced it would invite girls into its ranks. The Girl Scouts are seeing renewed interest. But when it came to inviting girls into its ranks, well, it doesn’t look like the organization thought things through. As girls started joining Cub Scouts — older girls will be allowed starting in 2019 — the Boy Scouts of America took the opportunity to announce its new name: Scouts BSA. They dropped “Boy” from the front — but still tacked it onto the back in the acronym for its parent organization. As if we wouldn’t notice. “It’s still ‘Boy Scouts of America,’ ” said Megan Ferland, CEO of the Girl Scouts of Western Washington the other day. “It still stands for ‘boy.’ They’re letting girls in, but it’s still the Boys Scouts. Since the announcement, Ferland has seen new attention being given to the unique role that the Girl Scouts of America plays in the lives of girls and young women. The public is reaching out more to offer support, and membership “continues to climb,” Ferland said, but doesn’t have official numbers. When the Boy Scouts’ decision to accept girls was first announced last fall, it said it came “after years of receiving requests from families and girls” to join. Why wouldn’t these girls just become Girl Scouts? To Ferland, it is the best option. Thanks to the last 18 months of female uprising, of girls marching with their mothers and engaging in community outreach (some for the first time in their lives), the Girl Scout mission has grown well beyond the cute stage. Six years ago, the Western Washington Council prioritized diversity, equity and inclusion, and now require staffers to participate in 32 hours of what’s called DEI training. Two years ago, the council made national news when it returned a $100,000 donation that came with a provision that the money couldn’t be used to support transgender girls. Within the troops, Scouts as young as Brownies (ages 7 to 9) participate in “Power Up,” a program focused on preventing bullying. As girls get older, the program progresses into relational violence in teen relationships, and what is and isn’t harassment. Scouts of all ages are participating in a vibrant STEM program that Ferland hopes to expand all over the state. Last fall, Google announced a $50,000 donation to the council to help it grow. 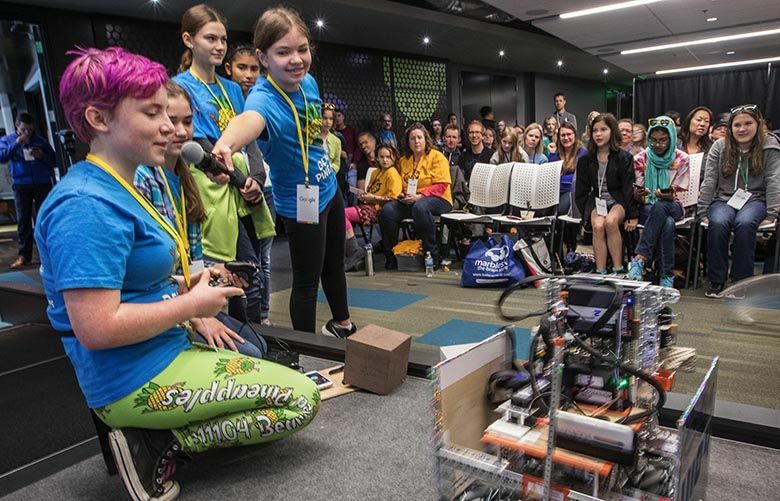 Inside the council’s Georgetown offices is a “Maker’s Space,” where Scouts hone their science and technology skills, including robotics. Ferland hopes to create a Mobile Maker’s Space that can visit Scouts in other parts of the state. At the high-school level, Girl Scouts are part of a Global Action Team that has launched health care projects for women and girls in Third World countries. If they stay with the Girl Scouts through high school, they can become Gold Award earners, which is recognized on college admissions and allows them to enter the Armed Forces at a higher rank. Ferland doesn’t understand why a girl wouldn’t stay with Girl Scouts through high school. Those opportunities — and skills — can serve young women throughout their lives. In a recent opinion piece in The Seattle Times, Ferland noted that while women represent only 6 percent of CEOs in our country’s biggest companies, 80 percent of all female business owners were Girl Scouts. And while only 21 percent of U.S. senators are women, 71 percent were Girl Scouts. So while it’s great that the Boy Scouts have opened their doors to girls — and even changed their name! — the Girl Scouts are giving them all they need to bust down a few of their own.